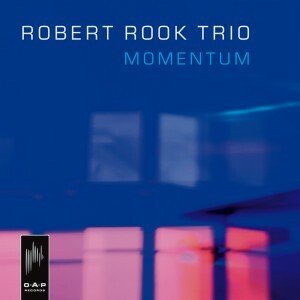 Robert Rook, the unique Dutch pianist who released the CD “Introducing Robert Rook” in 1997 and re-released it in Japan in 2003, is releasing a new CD. The recordings date from June 2003 till Januari 2005. It consists of 3 tracks piano trio and on the other 3 tracks a tenor saxophone is added. The compilation consists of 3 well known standards and 3 original compositions. The pianist is really telling a story with dynamic action phrasing and cool and smart romantic expressions. This is very thrilling and exciting and at the same time also lyrical. Because everything is recorded live the performances are sounding fresh and unrestricted. The pianist (bandleader) masters the idiom of Evans, Hancock and McCoy, but rebuild this into a world completely his own with a unique construction that is dynamic, full of contrasts, lyrical and architectonic. The last 3 tracks the saxophone player joins the band and the music goes even further. The saxophonist plays at some times fast and bluesy at other times cool and playful, but later on also with a thrilling blowing sound. Now and then the pianist plays fast and acrobatic licks that sound both relaxed and exciting. Overall on one hand the music sounds emotional, spicy and heavy, on the other hand it can also be called lyrical. You And The Night And The Music, Dolphin Dance, Nothing Rhymes on a Waterbike, Round Midnight, Monk is the Man, Dangerous Cats.